Notes: This theater was added to the National Register of Historic Places in 1985. This coming weekend, march 21 and 22 the Old Redford is showing the Blues Brothers Complete with organ show. I attended the Redford for the first time last night and I was floored. What an awesome place! I really enjoyed the atmosphere there. The clouds and and stars where very cool. I must say the atmospheric theatre is one of my favorites. I talked to the volunteers about the place. They were very friendly and welcoming. I even got a tour of the projection booth! The organ playing was great! It is so nice to see a place like this is still around so that some of us younger people can see some of the great things that existed in the recent past. Too bad I live over 300 miles away as I would love to go there more often. Almost forgot to mention the great volunteers who made the night possible in the first place. GREAT JOB, YOU ROCK. 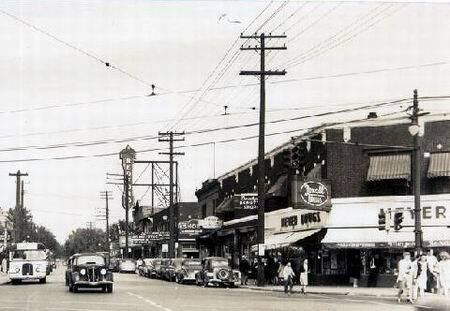 Just went and saw the Beatles Movie, Hard Days NIght at the Old Redford in Detroit lasst night. What an awesome time, and amazing theatre. I guess thats the way theatres are supposed to be. Organ player at intermission and a cartoon at the begining(I missed the cartoon as I got there late). They are showing some cool stuff in the coming weeks. Popcorn was excellent. People are attempting to revive the area as a family destination which is cool. Wish Blight Busters had kept working with Aurora Harris though on a side note as she is a great presence in any community and a great activist and poet. The Irving was more fun for us kids in the fourties and fifties (cheaper, more serials, triple features etc. ) The Redford though had a lot more class. Looks like it still does. I lived half way between em. This 1928 Detroit neighborhood house was built to resemble a Japanese outdoor garden theater. The theater was opened by the Kunsky chain, and purchased by the Goldberg family in 1931 as part of their Community Theaters circuit. The Motor City chapter of the American Theatre Organ Society took over operation of the Redford in 1974,and purchased the building in 1977. Since that time the all volunteer staff has run it as a classic films/rental/stage show/organ concert venue. Much of the original Japanese decor was altered in past decades, and the MCTOS have been working for many years to re-create what was lost. Recently the theater has a new computerized light board and new historically accurate seats (expensive!). Restoration is continuing as funds and time permit. The Classic film series shows a different film every other weekend. Cinema Treasures Link. Redford Theatre moves closer to its former glory By Christy L. Breithaupt / The Detroit News DETROIT--George McCann dreams of a theater where the silver screen is reunited with the golden age of cinema. 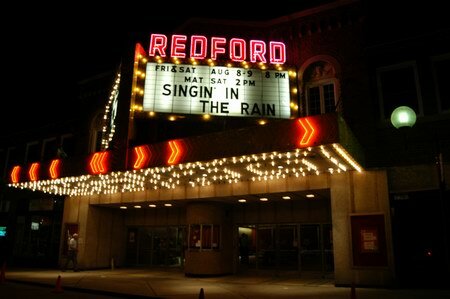 That vision is nearing reality at the Redford Theatre, a 75-year-old Detroit movie house that shows mostly classic films, such as Casablanca and Singing in the Rain. McCann, 76, and 50 volunteers have spent the last two decades restoring the Redford; and with repairs nearly complete, the glitz and glamor of the theaters McCann visited as a child is beginning to show. That was a big night out. That was your entertainment. These theaters used to just pack people in, McCann says. The Warren resident and retired theater manager is dedicating his time to restoring the Redford Theatre, owned by the Motor City Theatre Organ Society, Inc. A fluctuating economy and the introduction of multiplex theaters have had a devastating effect on single-screen theaters, but the Redfords volunteers can still see its underlying beauty below layers of paint and decades of damage. I think weve got a real gem here, says Allen FitzGerald, 47, a restoration volunteer for the last 20 years. This was my movie theater as a kid. I dont want to lose the memories. A Japanese garden was the original decor of the theater. Bright green vines stretched up the walls into a robins-egg blue ceiling while royally dressed Japanese women held court in delicate paintings. In front of the stage sat a regal black organ adorned in vicious-looking gold dragons. Volunteer Charlie Mack, 52, of Detroit says people who were at the theater when it opened in 1928 come in now and say, Oh, it looks exactly the same. The theaters restoration relies also on donations and box office sales. Volunteers still must contend with decades of water damage to the ceiling of the outer lobby. But theyve salvaged original features, such as the chandelier and organ. 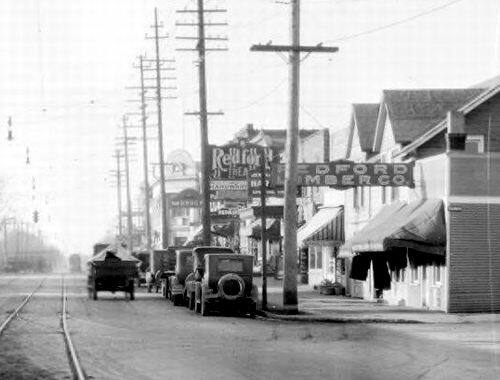 McCann hopes to have the Redford restoration, begun in 1982, completed in two years. He estimates the projects total cost at nearly $500,000 dollars. I want them (younger patrons) to see a movie palace that theyve never seen before and enjoy the ambience, McCann says. 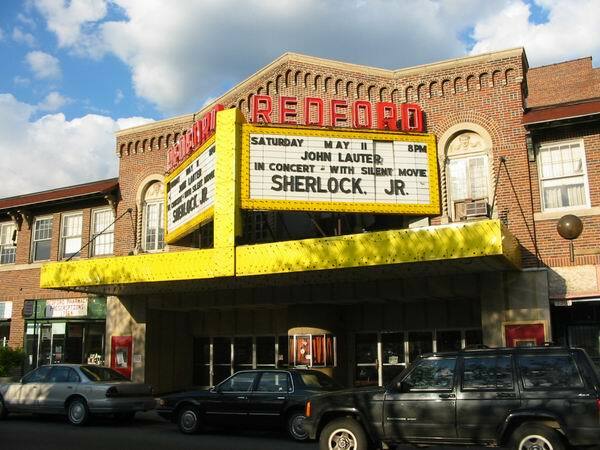 The Redford Theatre is a red brick structure with a symmetrical, two-story front containing the entrances to the theatre and flanking storefronts. The exterior contains a composite of stylistic elements while the interior contains Chinese and Japanese design themes. A recessed area at the center of the west facade houses five sets of aluminum doors which open into the theatre lobby. A ticket booth projects from the center of the recessed area. The walls at the entrance are now faced with aggregate panels colored brown and white. A yellow and red enameled metal marquee spans the west facade above the entrance. The second story of the west facades central portion houses four windows, two of which are obscured by the marquee. The windows decorative surrounds consist of twisted columns with Corinthian capitals, limestone, round-arch heads, and a tympanum containing swags and comedy-tragedy masks executed in relief. The central portion has a low gable and its cornice is embellished with a brick corbel table. The Redford Theatre is significant as an unusual example of Chinese-Japanese theatre design and as a well preserved example of the atmospheric theatre genre of the 1920s. 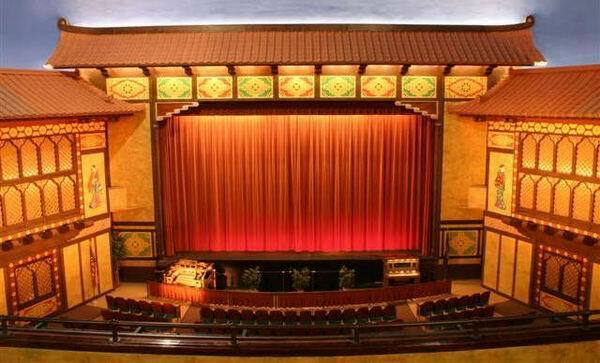 The theater is significant as well for its long and continuing role as an entertainment center. The Detroit firm of Verner, Wilhelm and Molby, engineers and architects, with Detroit engineer Ralph F. Shreve as an associate, designed the theatre. The firm survived only a few years in the 1920s before the partners split the business, and the Redford is their only documented theatre design. The structures auditorium contains a Barton organ in the auditorium. 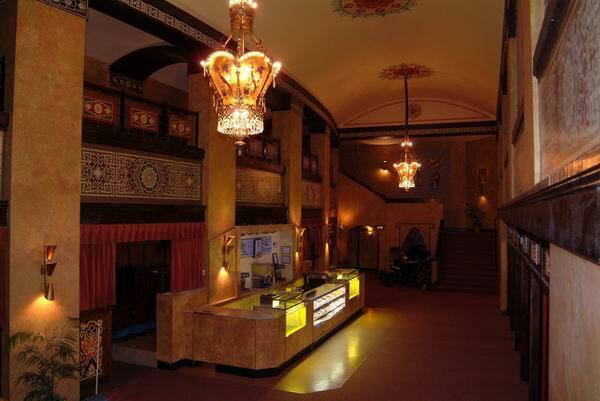 The Motor City Theatre Organ Society leased the theatre from 1974 until 1977 when its members voted to purchase the building. Since that time MCTOS has restored much of the theatres outstanding oriental interior design and its Barton theatre organ.